A stop-loss order limits the risk of a trade. It is the best friend of a trader who wants to survive and realise his long-term potential profits. Most traders find comfort in having stop-losses to protect them. But often, they do not give much thought to how they set their stop-losses. To truly realise the benefit of having stop-losses, you must adopt a logical mindset. 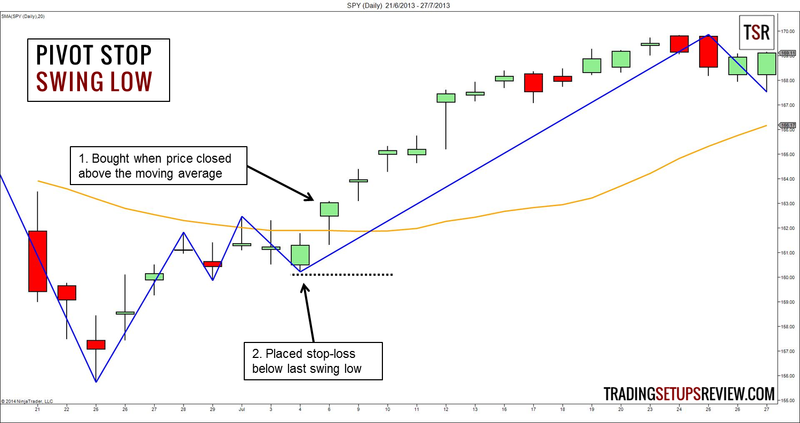 Before we discuss how to set stop-losses, let’s take a look at how not to set stop-losses. The two questions below summarise the wrong thought process for setting stop-losses. 1. How much do I want to lose? Let’s say I want to limit my risk to $200. 2. What is the implied stop-loss price? I am buying 100 shares of stock ABC at $50. To limit my risk to $200, I must place my stop-loss at $48. Thus, I will place my stop-loss at the $48 price level. What is wrong with this thought process? It disregards market price action completely. We determined the stop-loss level purely based on our risk preference. To the market, that stop-loss point is arbitrary and meaningless. A logical trader thinks through the following questions in sequence. 1. What is a logical stop-loss price? A logical stop-loss point is not implied by our risk appetite. It is highlighted by market price action. Stop-loss levels based on price action allows us to limit our risk while giving breathing space for our trades to wiggle. 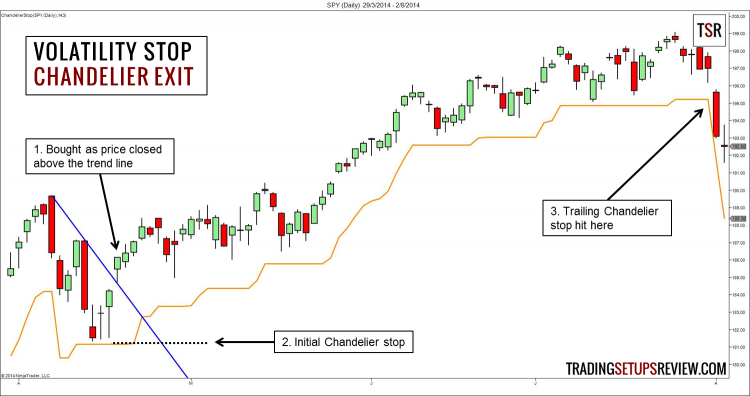 There are two primary methods for finding stop-loss points using price action. Ideally, we want the market to stay away from our stop-loss point. Hence, for long trading setups, using support levels as stop-losses is logical. The same goes for using resistance levels to set stop-losses for short trading setups. Candlestick patterns and bar patterns offer minor support/resistance. When trading with price patterns, place your stop-loss below (or above) them. 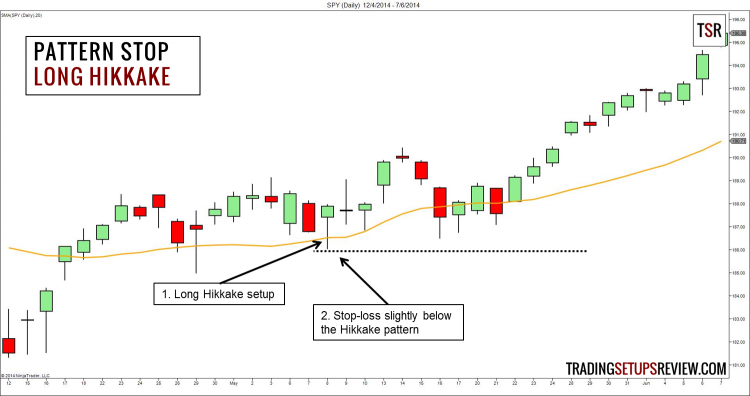 In the example above, we placed a stop-loss order below the long Hikkake pattern. This long Hikkake pattern bounced off the moving average, and we went long. The natural pattern stop was slightly below the low of the Hikkake pattern. Swing pivots are also natural support and resistance suitable for placing stop-losses. In the chart above, we marked the market swings with blue lines. Here, we entered the market without a specific price pattern. Instead, our trade trigger was the market closing above the moving average (orange). We placed our stop-loss slightly below the last swing low, which acted as market support. 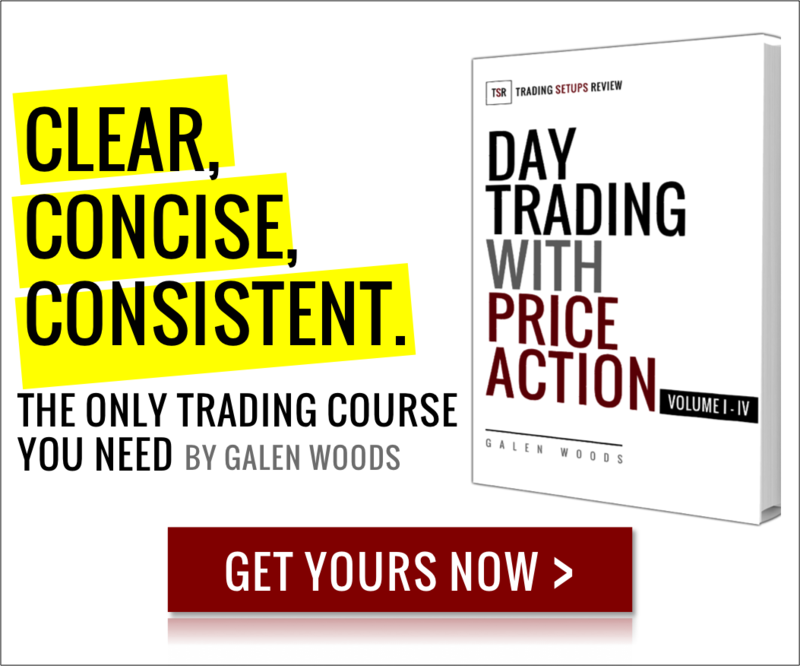 The ideal stop-loss is one that offers enough space for a trade to wiggle. How much space (price range) is enough? The answer depends on the market’s volatility. Hence, another logical method for setting stop-losses considers the volatility of market price action. 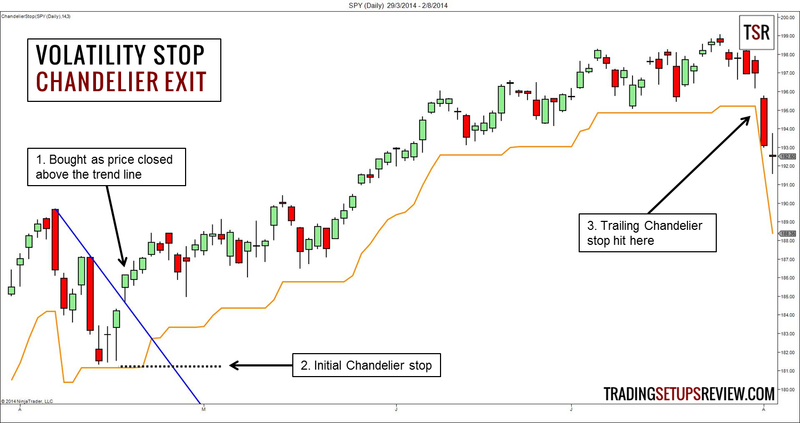 The classic example of a volatility stop-loss is the Chandelier Stop. It uses the Average True Range (ATR) as a measure of market volatility. Then, it places a stop-loss based on a multiple of the ATR. In the example below, we used the 14-period ATR multiplied by three for our Chandelier Stop (in orange). We bought after the market broke and closed above a minor bear trend line. Based on the Chandelier Stop, we placed our initial stop-loss here. The Chandelier Stop is often used as a trailing stop-loss. In this case, it performed well. We were able to trail the market upwards for a nice bullish run. 2. How much would I need to risk based on the logical stop-loss point? For instance, a pattern stop implies a stop-loss level at $40. We intend to enter at $50 with 100 shares. We will need to risk $1,000. 3. Can I afford to risk that amount? I have $2,000 in my trading account. That is all I can use for my trading activities. If I lose it, I can no longer trade. If I lose $1,000 as implied by the pattern stop, I run the risk of suffering a 50% drawdown. I cannot afford to take the risk. In this case, regardless of the trading setup’s quality, this trade is too expensive for me. I must pass the trade or scale down my position size to lower the trade risk to an acceptable level. I have $50,000 in my trading account. $1,000 is only 2% of my risk capital. A loss of 2% will not ruin my ability to continue trading. I can well afford to take this risk. Hence, I will take the trade. The misguided trader starts with his personal risk preference and proceeds to place a stop-loss in the market. He has already decided that he wants to enter the market before evaluating his risk. On the other hand, the logical trader considers the market risk before deciding if he wants to enter the market. He starts with an analysis of the market for potential stop-losses. Then, he considers his risk preference. Ultimately, he enters the market only if he is able to bear the risk. Stop-losses limits risk and are critical to a trader’s survival. However, if you do not set your stop-losses logically by placing the market first, they are pointless. Remember, market first. And do not trade when you cannot afford to lose.